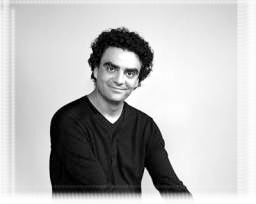 Rolando Villazón (México, 1972) is internationally recognized as one of the greatest tenors of our time. In addition to his operatic career, he is also a director, set designer, clown and hosts a classical music TV show. He is Chevalier des Arts et des Lettres and also a member of the Pataphysics College in Paris. Malabares (Espasa, 2013) is his first novel. He just finished his second one, that will be published by Rowohlt next year.